Within hours of a teenager being rescued with multiple injuries from the home of her father in Hyderabad, came the case of an 11-year-old child forced to work as a domestic help. 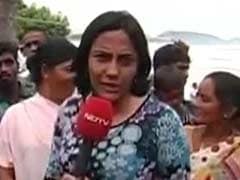 NDTV's team was part of the rescue operation on Wednesday. We had information from a neighbour, who requested anonymity, about the child being kept as a domestic help and being abused physically at a house in Mehdipatnam area of Hyderabad. The owner of the house, Farheen Sultana, told NDTV that Afreen was handed over to her 10 years ago by another domestic help, who told her the baby's mother had died and the father had remarried. "I have looked after her since then like one of our own children,'' she insisted. Just one look at Afreen and the other children told a very different story. Afreen stood in one corner, looking weak and small and terrified in a loose, hand-me-down salwar kurta. The other children, at least two boys and one girl, were smartly dressed and confident just in the way they were walking about and watching us. "So do you send her to school?'' I asked. "I did, but she refused to study,'' was the quick reply. "And do you use her as domestic help?'' I asked. "No. She stays with me all the time, even when I travel and does small tasks for me,'' the owner said. "Do you ever beat her?'' I asked. "Why would I? Of course, sometimes when she makes a mistake, I do beat her, just like I would any of the other children. Like when she sometimes steals food,'' the 50-year-old said. "A child steals food when she is hungry, isn't it?'' I asked her. We had taken a doctor along to examine the child and I insisted on that being done in my presence, so I could chat with Afreen. As soon as we were out of earshot of the rest of the house, Afreen looked at me with tear-filled eyes and said, "Please say thank you on my behalf to the uncle who told you''. That made me so guilty. This child had been waiting to be rescued for a very long time. There were fresh scratch marks on her face and hands. There were some older marks on the body, including an old scar of a burn on the left arm. "She beats me with rubber pipe or rod, scratches me and sometimes bites me,'' Afreen said even as tears rolled down her cheeks. "And she's lying. She has never sent me to school,'' she added. As the child rescue team was taking Afreen away, the "owners" resisted. Neighbours whispered that they were so glad the girl had been rescued. "They used to ill-treat her. Put chilly powder on her, beat her, deny her food,'' a neighbour said. Another said Afreen had been bought for Rs 6000 when she was very young, to be kept as a help, to live invisible to the world outside. But why had no one complained for so many years? No answer. Afreen has now been shifted to a government-run home. She needs love and care, an opportunity to hope. Will we be able to give this innocent child a chance to dream and live the life she deserves?